Throughout Chinese history, appeals to the imperial court allowed the common people to express grievances and let their voices be heard. But for Falun Gong practitioners in China, who have suffered over 13 years of cruel persecution under the Chinese Communist regime, making an appeal to the local authorities is an incredibly difficult and perilous journey. Qin Rongqian, 23, witnessed this firsthand when she traveled to Beijing to petition for her family members who have suffered persecution for practicing Falun Gong, a peaceful meditation practice based on the principles of truth, compassion, and tolerance. 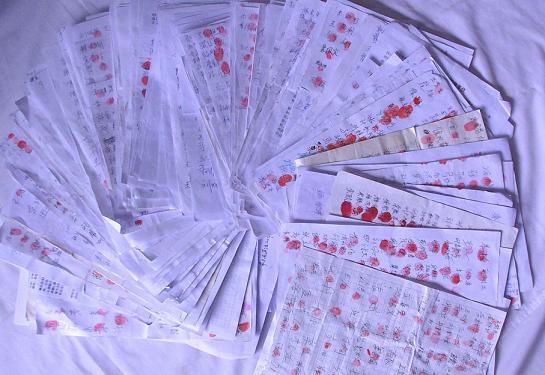 Qin caught public attention when she collected 15,000 signatures and thumbprints from residents of Heilongjiang Province to support her pursuit of justice for her family. Qin’s father, Qin Yueming, was tortured to death for his faith, while Qin’s mother and younger sister were each sentenced to one and a half years of forced labor for demanding an investigation into Qin Yueming’s death. Qin Rongqian herself was detained and tortured at the Harbin City Dongli District Public Security Bureau in 2011. With the strong support of so many local residents, Qin decided to travel to Beijing and appeal for her family’s case. Qin, along with three attorneys, arrived at the Supreme People’s Procuratorate in Beijing on July 5. They were immediately surrounded by a group of people, who proceeded to follow and film them, until finally, they escaped the group’s attention and entered the building. So Qin and the attorneys set out for the Supreme People’s Court. As they were about to stand in line, five or six plainclothes police immediately surrounded them and asked where they were from. Qin’s group managed to push their way through to the gate, which was guarded by over 20 judicial police. The attorneys tried to explain their case to the judicial police, but the plainclothes police remained close behind and followed them inside. Once again, Qin was told she needed a written verdict from the Heilongjiang Province High Court to file for an appeal. Qin’s lawyer explained that the case was established in the High Court on Sept. 8, 2011, but the court deliberately delayed the verdict and the case’s statutory time limit on the case had passed. On July 6, Qin and her three lawyers tried one last location to appeal: the National People’s Congress Standing Committee Petitions Bureau. However, the judicial police at the door interrogated them and refused to let them, maintaining that a ruling from the Heilongjiang Province High Court was required. Qin has persisted for a year and a half trying to clear the injustice done to her father, but has come across numerous hurdles within the Chinese Communist Party’s legal system. However, Qin expressed that she will not give up. She will continue to demand justice for her family until she brings her case to the highest court in China, the Supreme People’s Court.